Pharma Dynamics has launched a new over-the-counter product, called Nexa AllerShield, which contains cellulose powder that literally ‘shields’ the nasal membrane of patients from nasal allergens. 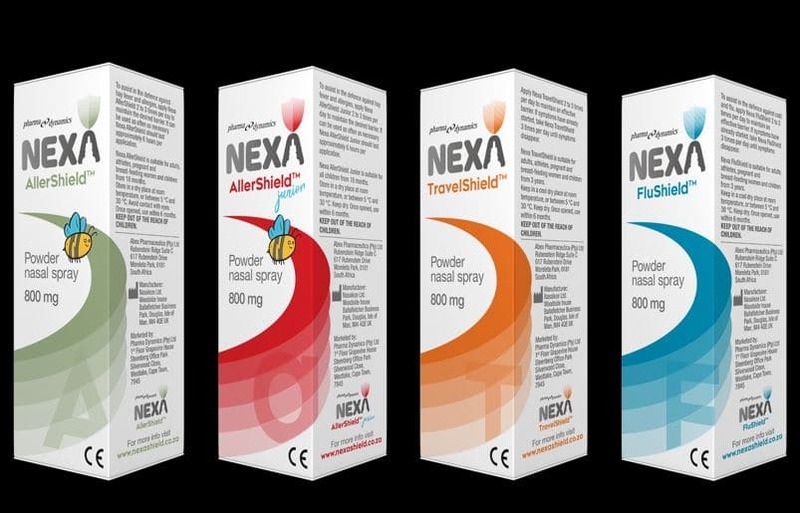 Nexa AllerShield is the first nasal powder spray launched into the South African market, but the product has been available abroad in more than 50 countries worldwide and is a top-seller in the US, Europe and Australia. The product contains an inert natural cellulose powder of vegetable origin, called hydroxypropyl methylcellulose (HPMC). When administered, the powder acts as a barrier by coating the inside of the nasal cavity to protect against allergies caused by airborne allergens. Allergic rhinitis is one of the most common chronic diseases globally and whilst not life-threatening, its symptoms can severely impact sufferers’ quality of life. Nexa AllerShield is a first for South Africa. It comes in the form of a powdered nasal spray and is aimed at the estimated 30% of South Africans that suffer from nasal allergies, which is on the increase. More than 20 clinical trials prove that the product is effective in relieving symptoms such as sneezing, runny/itchy nose and eyes as well as nasal inflammation,” she says. One such study is a randomised trial amongst 64 patients comparing the widely used nasal corticosteroid, mometasone, with Nexa AllerShield. The treatments were found to be comparable in controlling symptoms of allergic rhinitis. The severity of sneezing, runny nose, tearing, nasal congestion, itchy eyes and scratchy throat were evaluated at the onset, 14 days and 28 days after treatment. Nexa AllerShield substantially improves the rate of Nasal Mucus Clearance and PNIFR (Peak Nasal Inspiratory Flow Rate) and reduces the need for rescue medication. The efficacy of Nexa AllerShield is similar to that of steroidal nasal sprays in controlling symptoms of allergic rhinitis. It can therefore be used as an alternative for corticosteroids, particularly in children older than 18 months, as well as pregnant and breast-feeding women. It is also recommended as add-on treatment to antihistamine use. During clinical trials, 85% of chronic hay fever sufferers reported a significant improvement in allergy symptoms after only three weeks of use. After a further three weeks, 90% of participants said their symptoms had vastly improved. Nexa AllerShield is also non-drowsy and medicine-free, which means it can be used by children (older than 18 months) and pregnant or breast-feeding women. Nexa is available in four variations, namely Nexa AllerShield, Nexa Allershield Junior, Nexa TravelShield and Nexa FluShield and are all underpinned by clinical studies. All four Nexa products will be available at all leading pharmacies from November onwards and retails for R 134.40 (incl. VAT). Note that Nexa AllerShield is not suitable for use in children under 18 months or individuals who are sensitive to cellulose and/or mint. Nexa Allershield Junior is not suitable for use in children under 18 months or individuals who are sensitive to cellulose and/or strawberry. Nexa TravelShield and Nexa FluShield is not suitable for children under 3 years or individuals who are sensitive to cellulose, mint or garlic. For more information on Nexa products, visit www.nexashield.co.za and be sure to refer to the respective instructions for use as approved in June 2018.